If you’re looking for a spacious subcompact car, then the MINI Cooper Clubman may be the one for you. It’s small enough for easy parking in Annapolis, Highland Beach, or Hillsmere Shores, but it’s also big enough to fit your friends and their belongings inside. See what we mean in this review on the 2018 MINI Cooper Clubman dimensions. Learn all about the vehicle below, and contact us at MINI of Annapolis if you have any questions. As a subcompact car, the MINI Cooper Clubman is great for city driving, especially since it can easily maneuver in and out of tight spaces. The vehicle has a sleek design and is sharp, distinct, and aerodynamically inclined. Plus, its iconic split rear doors are not only charming, but they also allow for bulky luggage to easily fit inside. The Clubman comes in lots of great color options, including Chili Red, Lapisluxury Blue, and British Racing Green II. Plus, you can get red racing stripes added to the front, top, and sides of the car, making it stand out even more. Although it’s a subcompact vehicle, the 2018 Clubman has plenty of room for five passengers. Up front, you get 40.2 inches of headroom and 41.4 inches of legroom. In the back, there are 38 inches of headroom and 34.3 inches of legroom. There’s plenty of cargo room, too. In the back, you’ll have 17.5 cubic feet to work with. When the rear seats are folded down, that cargo space will expand to 47.9 cubic feet. Feel free to fit as many of your essentials inside the Clubman as it can handle it. Plus, the vehicle has an available Comfort Access/Power Tailgate. With keyless entry, you can open the door while keeping the keys inside your pocket or purse. It also allows you to access the cargo area when your hands are full. Just swipe your foot under the rear bumper, and the split rear doors will automatically open. 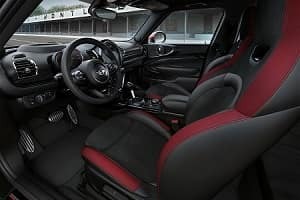 The MINI Cooper Clubman has lots of amenities to help keep everyone happy, especially in the technology department. Apple CarPlay™ will allow you to access your favorite apps right on the display screen. You can listen to podcasts, send text messages, and more, without messing around with your smartphone. The vehicle also offers a touchscreen navigation system. Just enter in the destination, and real-time traffic updates will help you get there in no time at all. Heated front seats are available in the Clubman to help keep you cozy on chilly nights. An 8-way power-adjustable driver’s seat is available, too, so you can get in that perfect position behind the wheel. Furthermore, if you like to stay warm, but your co-pilot wants to cool down, then you can take advantage of the standard dual-zone automatic climate control system. This lets you each choose your preferred temperature settings, so no one has to compromise on their comfort levels. Not only are the 2018 MINI Cooper Clubman dimensions impressive, but its features are, as well. 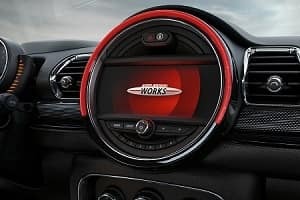 To learn more about this vehicle, schedule a test drive at MINI of Annapolis.